You ever wonder,"Geez…if people spent as much time and energy on inane ideas as they did on Diabetes research, there'd probably be a cure."? That was my first thought when I saw this. Then I realized…I don't really think the people who invented tooth tattoos should be allowed near a medical lab. On a certain level, Howard Dental Lab's product makes sense. It's a logical progression from blinged out grills. After all, I have seen words and initials on a series of gold front teeth. So, I suppose this would be a grill for dentally innovative hipsters and art lovers. Plus we've all witnessed some bizarre fashion trends of late (um, Kate Moss forgetting her pants comes to mind) so this might not seem too odd in comparison. But, on another level…it's as creepy as those Hello Kitty contact lenses. 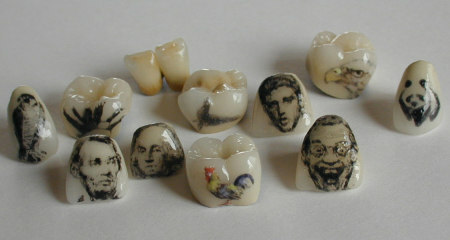 However, regardless of my hesitation in sporting a portrait of George Washington on my front tooth, you now have the choice. Simply acquire a crown, choose a work of enamel art (you can create or request custom tooth tattoos), and take it to your dentist for installation. So, email over a picture of your loved ones and let them literally be your smile…as well as chew your food. What do you think of this new trend? Take our poll and share your thoughts in the comments section below.